The Wood Butchers Guide to Technology: The "eye" in ipad. It goes without saying that the ipad is a great administration tool and a fantastic teaching aid for students with disabilities. Most people have found a thousand and one uses for it. One little aspect that I came across last week reminded me how good the apple platform is for people with little or no sight. Yes - it does sound like a contradiction. But it isn't. Considering the effort apple goes to to make the display of it's products hard to beat - one would wonder why on earth you would want something like an ipad if you had limited vision. Well - the ipad has one nifty little feature that makes it accessible to all. It has "VoiceOver". This allows the ipad to talk to you. It will tell you what app your finger is on, what orientation the screen is at, read email and webpages to you. It enables you to operate the ipad even if you were totally blind. If you touch an item it tells you the item. Double click and it activates, flick three fingers to scroll. It is found in your settings. In "General" - then "Accessibility" - "VoiceOver". There are a number of functions in the Accessibility tab that are worth experimenting with. Have a play. 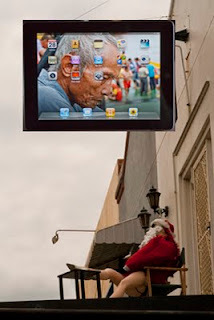 Just when you think you know all there is to know about the ipad - you discover something new. At least I do.